Internet Initiative Japan (IIJ) Review 2019: Is Internet Initiative Japan (IIJ) a Good Hosting? Internet Initiative Japan (IIJ) is a longstanding Japanese provider of web hosting. They offer three shared hosting plans with a good uptime guarantee. Founded in 1992, Japanese company Internet Initiative Japan (IIJ) has more than 3000 employees and an annual profit of over 5 million yen. They work with more than 11,000 mainly medium and large company customers as well as government organizations. Their website is available in Japanese and English. IIJ provides internet, WAN service, and network related services. Their network is truly global, with Network Operation Centers (NOC) in twenty-eight Japanese locations, five in the U.S., one in the U.K., two in Singapore, and one in Hong Kong. Each NOC is equipped with an uninterruptible power supply, air conditioning, fire extinguishing equipment, and a strict entry and exit management system. They offer three hosting plans: IIJ Web Standard 2 Service, IIJ Web High Grade 2 Service, and IIJ GIO Infrastructure P2. The basic IIJ Web Standard 2 Service plan comes with only 200MB disk space and 50 accounts, plus a “SecureWeb Manager” web interface for managing files, updating various settings and configuring disk usage. CGI, FTP, and automatic daily backups are included. If you need a little more disk space, the IIJ Web High Grade 2 Service plan comes with 1GB disk space (which can be added to in 1GB increments) and 50 accounts. This plan has a few more features than the base package, including support for Perl and PHP. If you’re ready to scale your online business, their highest IIJ GIO Infrastructure P2 plan integrates the public and private cloud and allows you to fully configure the servers and storage you require. It’s designed for customers who need a development environment, e-commerce website, SaaS base, or affordable “in-house” cloud system. Choose to use servers located in east or west Japan, increase the storage capacity of the NFS / CIFS server, and enjoy a 99.99% uptime SLA. Prices are very high for all three hosting plans when compared with local and international competitors. As well as the high monthly price, they also charge for add-ons such as additional disk space, extra accounts, and DDoS protection. I can’t deny that their infrastructure is excellent, but the resources are still too low to justify the premium prices. Plans cannot be bought online. If you’re interested in purchasing a plan, you need to complete a web form, contact the sales department, or send in an application form. Perhaps not the norm for overseas customers, this may be how business is done in Japan. The other downside in terms of their set-up is the lead time, which can be up to a week if you already own your domain and up to two weeks if you don’t. For a business of this size, I am little surprised by their limited customer service options. For support, you can email, phone, refer to the FAQ pages on the website, or check out their active social media pages. 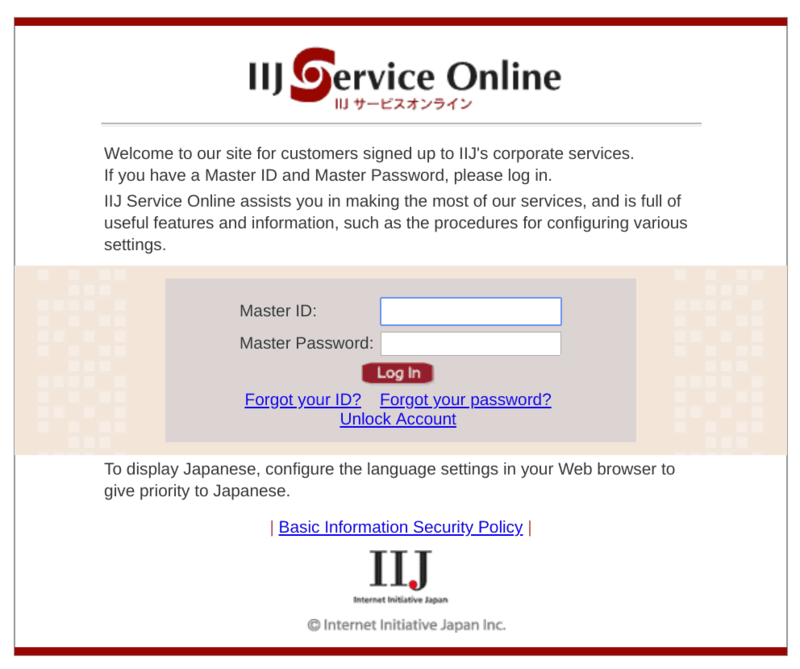 Customers with login accounts can also use the IIJ Service Online. IIJ is not merely a longstanding company, but also one of the leading Japanese providers of hosting. They were the first Japanese internet provider, and they continue to receive praise for the reliability of their services. Reliable Japanese hosting available now at IJJ. Wondering how Internet Initiative Japan (IIJ) stacks up against other Web Hosting companies? Enter any other Web Hosting company and we will give you a side-by-side comparison.